The more I went out to the field, and watched what was going on, the more a hierarchy began to emerge. Well not so much a hierarchy as defined groups of players. There seemed to be four main identifiable groups. During my career I found myself in every group, at one time or another. It wasn’t until years later I could see the four phases of my own career and spot it in the other players at the field. Of course there are exceptions to every rule, but typically I noticed that most players fall into one of four main groups. Why They Play: People normally go to the field the first time with a rental group. An end of season party for a sports team, birthday party, bachelor party, or team building for work are the most common introductions to the sport. They can’t put their figure out why, but for some reason the sport has a primal appeal to a novice player. 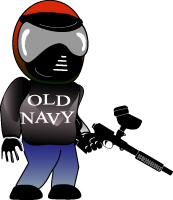 What They Wear: The novice player is afraid that being hit by a paintball will hurt so they normally wear a thick hoodie or sweater that they don't mind getting dirty. What They Use: Novice players start with an easy to operate semi automatic, mechanical rental marker, like a Tippmann 98 with a ‘gravity feed’ loader. Anything that will shoot a .68 caliber ball 290 feet per second is the novice players marker of choice. How They Play: The first few times on the field a novice player will typically spend most of the time safe behind a bunker, long balling at shadows. Their Team: Novice players are so amazed by the adrenalin rush that the thought of team play is unimaginable. The survival instincts hard wired into every human makes the Novice think only of themselves and self preservation. How You Can Spot Them: Novice players can be spotted by the greatly exaggerated stories of bravery and daring exploits excitedly traded in the staging area. Or, they sit in the staging area staring in wide eyed amazement at the organized chaos going on around them. Why They Play: Experienced players have been bitten by the paintball bug. Go out to the field for "walk on" days whenever possible and are starting to learn how to really play the game. 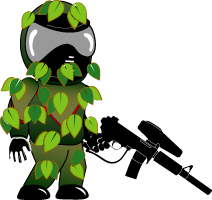 What They Wear: The experienced player wears camouflage and sometimes a ghillie suit. They have learned what works best for them, and how they like to play the game. A ghillie suit for the sneaky guys crawling through the bushes, or something a little more form fitting for players who like to run and gun. What They Use: An upgraded mechanical marker like a Tippmann A5 or X7 Phenom is typical for the experienced player with multiple firing modes and sometimes, cosmetic modification to make the marker appear more intimidating, a remote line to a tank on a vest is not uncommon. How They Play: Experienced players love walk on days and the opportunity to hunt the novice players coupled with the excitement of the occasional gun battle with another experienced player. Their Team: Experienced players make friends at the field and seem to naturally form a team by playing with the same guys week after week. This team of friends will travel to big games like a Tippmann Challenge or Hells Survivors. How You Can Spot Them: The experienced player dressed like he means business and is calm in the staging area. Experienced players often spend the time between games reflecting on the previous time out and how to score more eliminations. Experienced players are completely comfortable at the field the mechanics of the sport have now become automatic. Why They Play: By the time they become and advanced player paintball in the blood to stay. Now, only after it is to late, the advanced player realizes that paintball is more addictive than meth but is twice as expensive. They will be late on the rent, and miss car payments to have the money to play the next event. 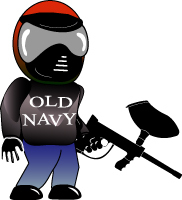 In the religion of paintball the advanced player is the true believer. What They Wear: The advanced player typically wears brightly coloured jersey, with matching pants. Standing on the field the advanced is easy to spot by the case of paint in pods on their back. What They Use: A flashy electro marker, like a Tippmann XVR, capable of sustained high rates for fire for an extended period. How They Play: Fire and move, fire and move, is the name of the advanced player's game. They live by the motto 'Paint is Power' and are only comfortable when 12 balls per second are skimming past the mask. Their Team: A team of advanced players is more than a bunch of guys with matching jerseys. The advanced team, to a man, ardently believes that nobody can beat them on the field. How You Can Spot Them: The swagger of the advanced player is unmistakable. They can not wait to get on the field and throw paint. 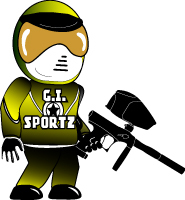 They live for the next gun battle and the chance to prove how good they are at the sport they love. Why They Play: The expert player can't imagine doing anything else. They go out on walk on days, will practice with a tourney team, ref a rental group, it doesn't matter as long as they are at the field. What They Wear: Usually the expert player will wear whatever is close at hand when they get up. Maybe that old Gap sweatshirt that is still in the closet. It doesn't matter a long as they can play. What They Use: The expert player will use pump marker, like a Tippmann SL68-II, or even a rental marker in order to jump in on a walk on game. Anything that will shoot a .68 caliber ball at 290 feet per second will be good enough for the expert. How They Play: The expert normally turns down the intensity when going out on walk on day. They try to help and encourage any novice players they come across. At times you can't tell the difference between an expert and a novice player who are behind the same bunker. The only way to tell is to get close; the one that doesn’t have eyes as big as pie plates is the expert. Their Team: Everyone around knows the expert players. They will play with almost anyone. The expert player just wants to play. How You Can Spot Them: The expert has been around a long time. They seem to get preferred treatment, and take a few liberties now and then, but field owners don't mind cutting them some slack because of what they give back to the game. These are merely my observations at the field over the years. This list isn’t intended to rank one style of play over another, or to say this kind of player is better than another. It takes every kind, and level, of player to make this sport what it is. On any given day a 12 year old with a rental marker can eliminate an advanced player with a high end elctro. Every skill level of player on the field together is part of what makes this sport great. No matter in what phase you find your career. If you have only played once, or you have played for twenty years, take every opportunity to play the game you love, and have fun doing it.